Tinker Bell and the Legend of the Neverbeast is a bit misnamed as Tinker Bell isn't in it very much at all. Instead, this movie focuses on Tinker Bell's friend, an animal-talent fairy Fawn. Apparently Fawn has a bad habit of hiding injured dangerous animals in the village which ends up getting her in trouble. So shen Fawn discovers a new, huge, never-before-seen animal she decides to keep it to herself. Fawn names the creature Gruff, and Gruff seems really determined to build towers out of rocks. Fawn is confused but decides to help out. Meanwhile, some torn pages from a book in the fairy village library strangely predict the appearance of Gruff and appear to indicate that a great storm will come shortly after his appearance, a storm great enough to completely destroy the fairy village. A fairy named Nyx is sure that this means Gruff will be the end of life as they know it unless they can stop him, but Fawn can't believe that and enlists her friends to help hide Gruff. This movie has some emotionally darker scenes than some of the other movies, but I think they work well in context. Again there are themes of friendship and love and trying to do the right thing, and figuring out what the right thing is. Tinker Bell isn't in that much so I think it should have been called something else, but Fawn makes a good leading fairy. And it's nice to see a new leading Fairy. There some good extra features on this release. My favorite is Five Essential Ingredients to getting Gruff which is a great making-of featurette that covers various aspects of creating the movie, including the voice actors and creating the roar for Gruff. Another good one is Jeff Corwin's Guide to Real World NeverBeasts where we are introduced to some very unusual looking creatures. The story and themes in the movie were pretty good, and the animation was beautiful. The movie itself is kind of short, clocking in at only about 75 minutes, but there are some nice extra features here to enjoy. This release comes with not just the blu-ray, but also a DVD and a digital version for watching on portable devices. I think it's a good entry in the whole Pixie Hollow franchise. 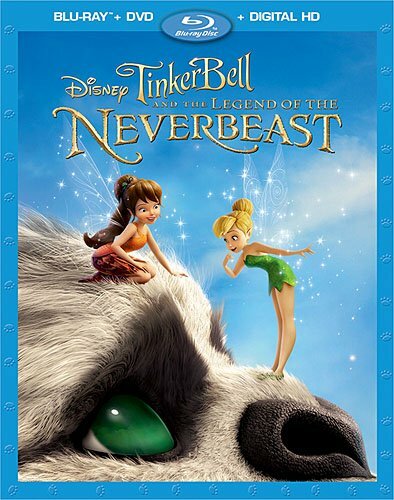 Tinker Bell and the Legend of the Neverbeast was released by Disney on DVD starting March 3, 2015.